The picture frames are from Wal-mart. The polaroid's of me as a baby. I don't even know how I came to hold onto them. I must have found them when my parents moved out of our house in the Valley. 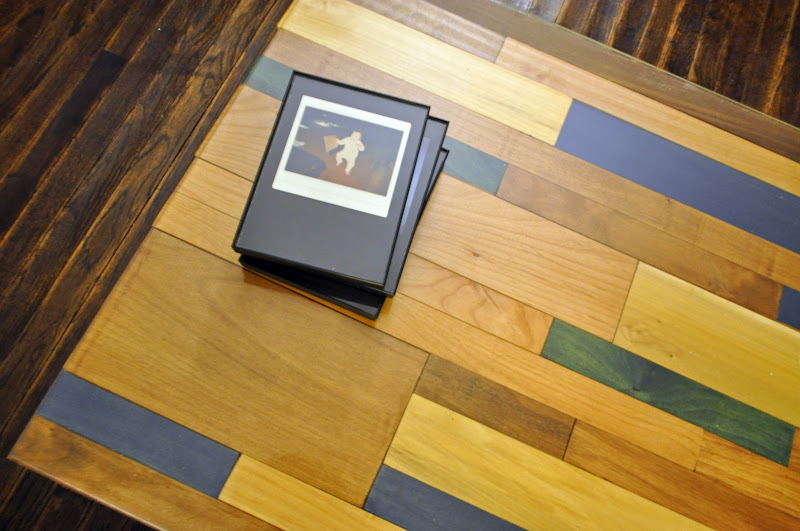 The coffee table I designed and made based on this abandoned storefront on Temple. Left: My shoes! And makeshift shoe rack from IKEA and Target. The wooden thing is from IKEA. 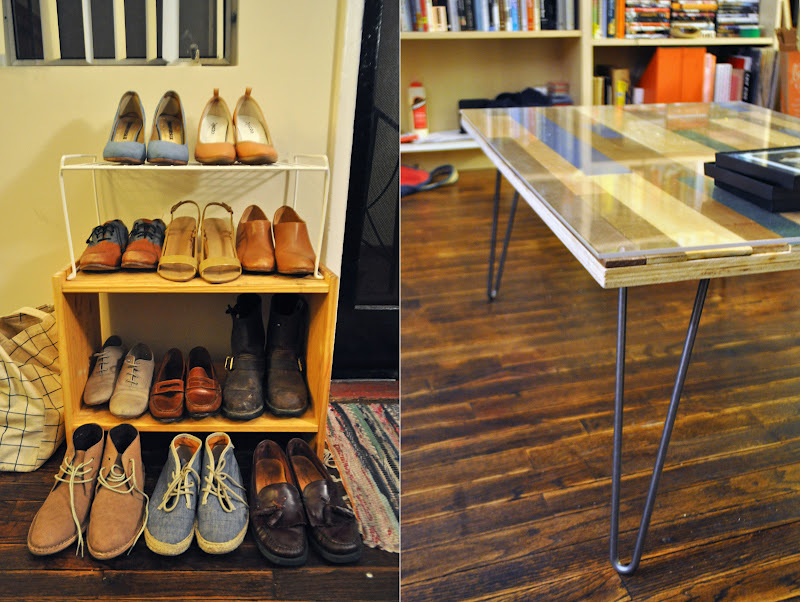 It's supposed to be a nightstand table but I think it works better as a shoe rack. And the white wire thing on top is where I used to put my printer under my desk. Right: I bought the legs online from hairpinlegs.com. 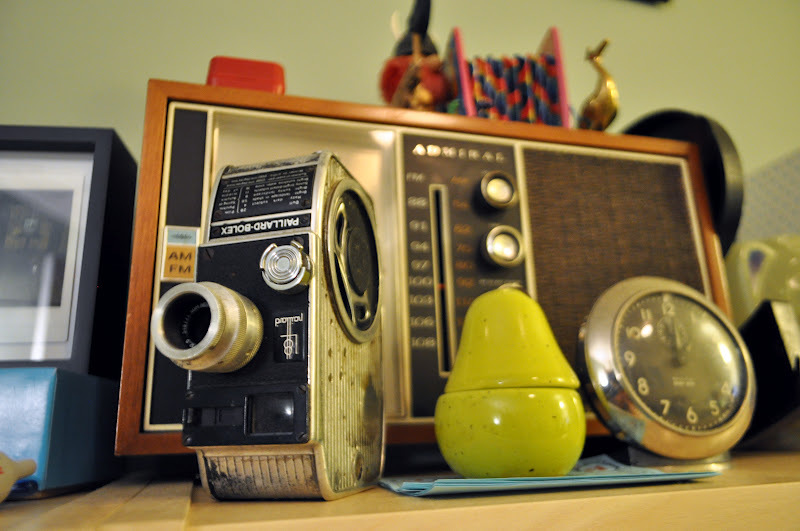 The wooden radio (it works) is from a flea market near my parent's house in the Bay. It's $0.25 to get in and they always have the best stuff. The camera (upside down, and functioning) is a double-sided 8mm camera I bought at a stoop sale in Brooklyn. The pear is a salt and pepper shaker from a gift bag from a recent wedding I attended. The clock (wind-up, working) is from this thrift store Lady Peter's Whimsy in Burbank. The harmonica, from my freshman year in college when I tried for one day to learn how to play. The viking from a trip to Solvang when I was a kid. The accordion from a Chinatown shop in SF during my freshman year. The golden bird from a Mexican lady who sold knick knacks on 3rd and Vermont while I was biking. The Letter S I stole from a venue when I went to see the Horrors last year. 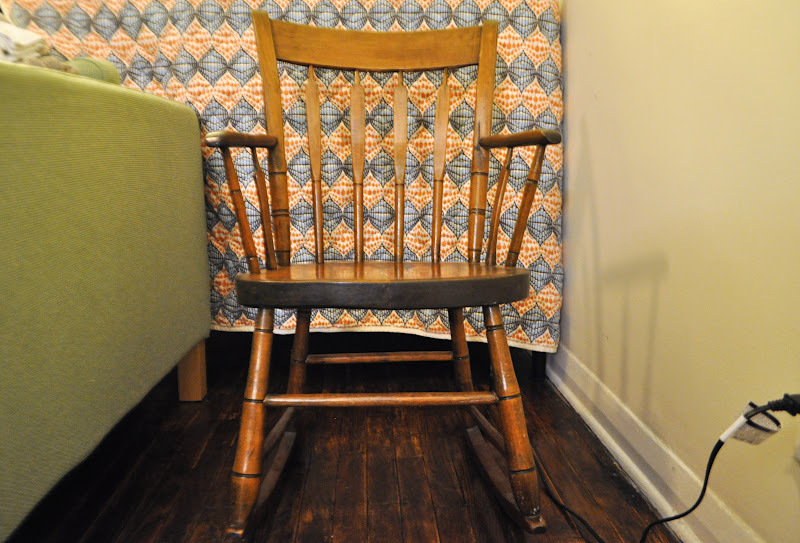 The rocking chair I bought at the Brooklyn Flea. It's the only piece of furniture I shipped over from New York. And the blanket is from Utility Canvas. Mini Jesus was a birthday gift from a friend. Jaguar from a trip to Disneyland when I was 18. Dinosaur and dragon were a birthday gift from a friend. Left: I got the light from a liquidation sale at this place called George's Light Shop on Hollywood. I pass by it on my way home from work everyday and one day I saw a giant red store closing sign so I thought I'd check it out and found the vintage lamp for sale. The gold magazine rack I found from Lady Peter's Whimsy. And the picture from is from a thrift store in Berkeley. Right: Candle from Marshalls, cactus from a garage sale near Griffiths Park. The glasses are from a Brian Jonestown Massacre light show I went to a few months ago. The Coachella card from Coachella 2012 (my first and last :)). The Fortune Card from a thrift store in Portland where they had the fortune telling machine similar to the one in Big. The fish postcard from a store in Korea. The piece of the Berlin wall from my friend Pedro, who visited last winter. The other post card from when I was in London (I used to collect postcards from places I traveled). Mashti Malone's sticker from this Persian ice cream shop in Hollywood. We were shooting late at night in Hollywood and everyone got ice cream there after we finished. The photo booth picture with me and my friends Aileen and Franky is from Portland. And the one of myself is from Mohawk Bend and it was for a profile picture on NationalHeadquarters.com - a filmaking collective/production company, I'm a member of (not sure if their website is up yet). 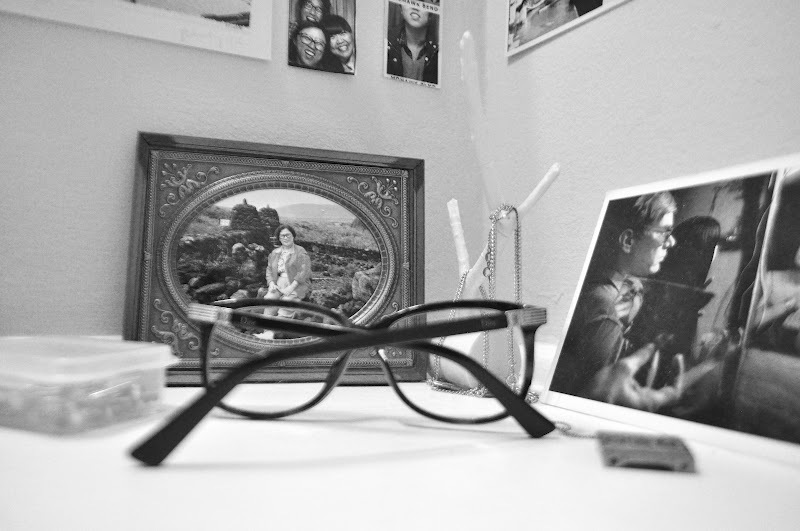 My glasses, my grandma in an old thrift store frame, an Andy Warhol postcard from when I used to be obsessed with him in college. 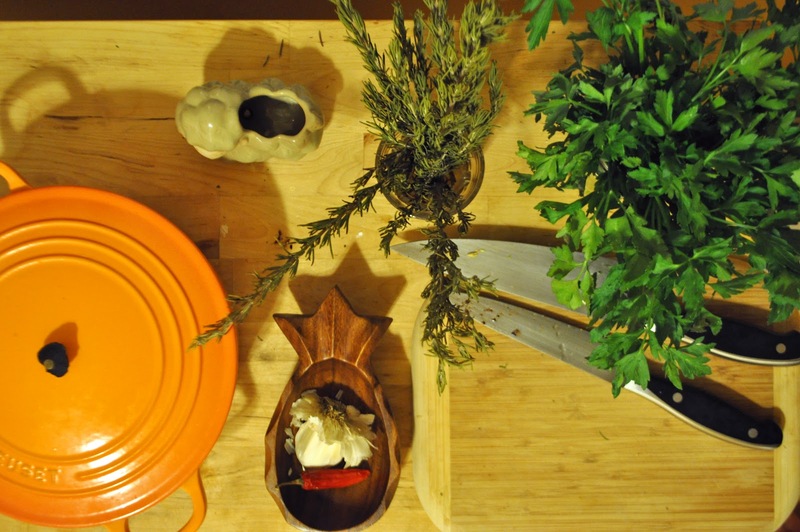 Le Creuset - a Christmas gift from my parents, wooden pineapple from Goodwill, sheep pot (empty) from an Echo Park florist, and herbs! At the beginning of the summer, my parents moved out of their 3-bedroom house in the suburbs into a 2-bedroom apartment in the city. Though there were many perks that spurred them to do this, one huge adjustment was the shrinkage in space. Whereas before my dad had a whole garage to stash his mess, he had to shrink it all to 1 closet. 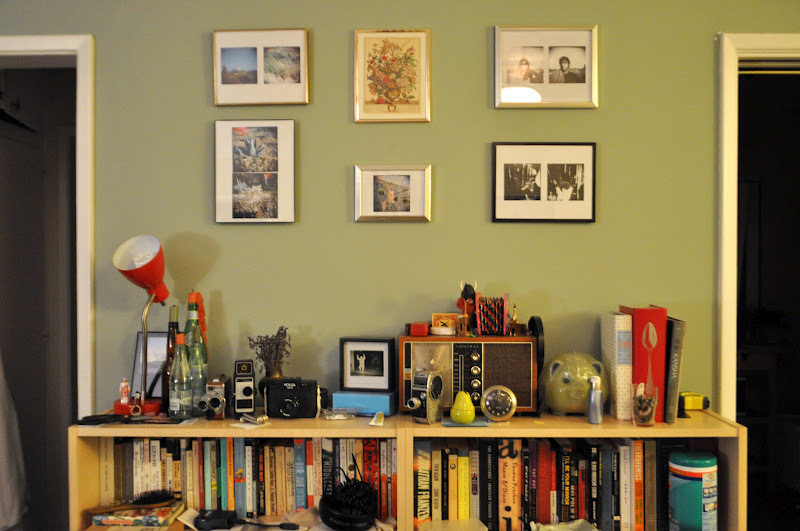 My mom had to reduce the knick knacks to a few key places around the new apartment. I don't know how they did it with over 10+ year of stuff and less space than me, but why does their apartment make my place look like a mess? 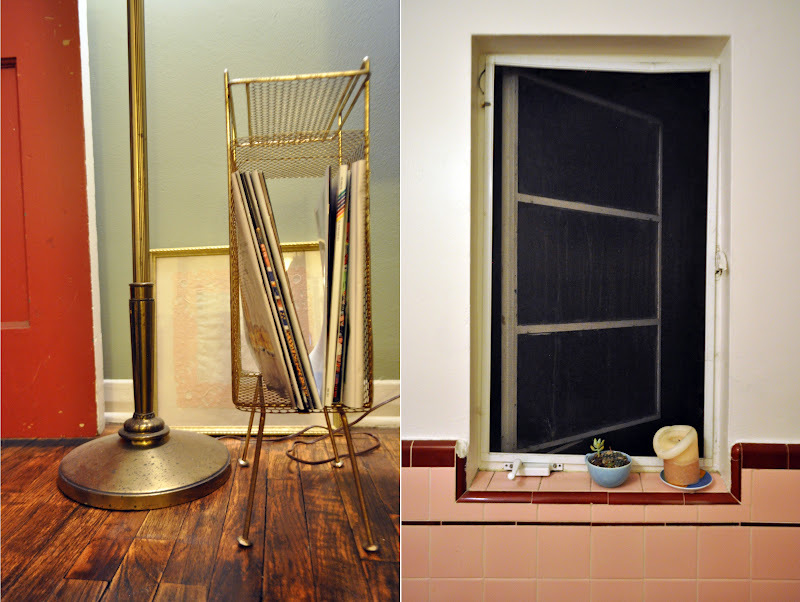 I decided to peek behind the pristine doors of my parents' apartment to take some organizing cues from my mom. Let's be realistic, my parents love TV. I like the way they incorporated it without acting like they're too cool for TV. This TV stand is also one of the few places that my mom was able to display her pottery/ceramics collected over the years. The stand is actually traditional lacquered furniture brought from Korea by my grandmother. The black lacquer jewelry box is a traditional wedding gift that my mom received when they were married. 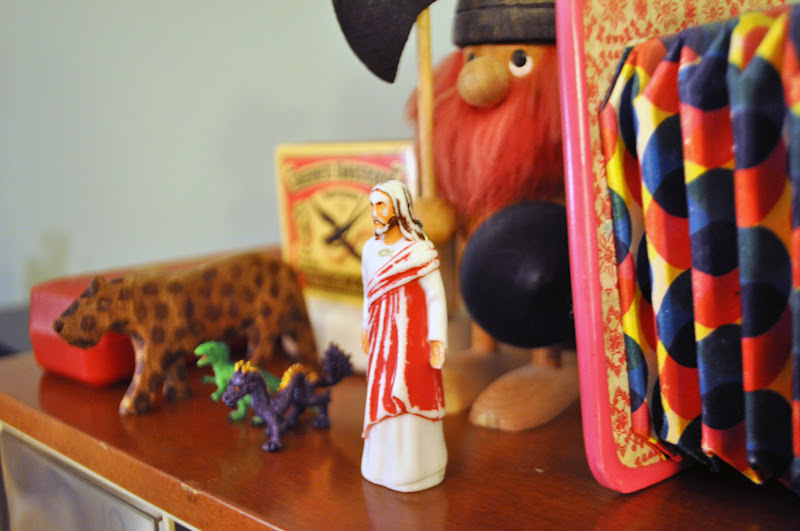 I love the little vignettes of pottery that my mom put together. When I say my mom has a tiny kitchen, I am not joking. That picture on the left just about shows the full extent of it. I complain about my lack of storage and space, but I guess I can't complain compared to what my mom has to work with. I cannot understand how my mom fits all her kitchenwares! That's just one cabinet, but there's more disgusting organized-ness where that comes from. Here's one more set of looks inside. 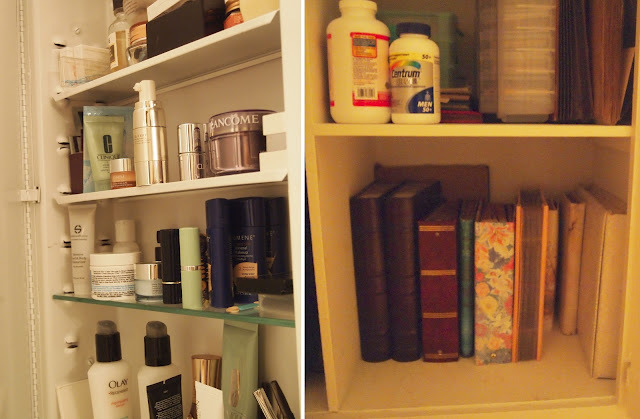 On the left is all my mom's bathroom stuff - that's make up, skin care, hair care. Everything! Pretty amazing. On the right is just one of the closets. In that closet, my mom hung up all her purses in one divider, uses one cubby for her Mama's Pharmacy, uses another to store paperwork, and organized all our family photos into the last cubby.